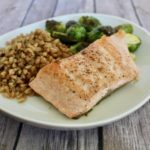 This Maple Baked Salmon comes together quickly and is a nice combo of sweet and savory. Pair with brown rice or couscous with some veggies and your dinner is complete. Combine syrup, soy sauce, garlic, garlic salt, and black pepper in a freezer bag. Add salmon and marinade for 30 minutes. Place salmon on cookie sheet and bake for 20 minutes uncovered.